Of all of the Scottish salmon rivers the mighty River Tay is the most majestic and is renowned for often producing big fish. It's normal on the Tay to connect with salmon in the 20 lbs class and on occasion much heavier fish than that are caught. The British rod caught record salmon of 64 lbs was caught on the Tay back in 1922 so its big fish reputation is nothing new. Catching any salmon is a result on any river but personally I always like to know I'm playing a 'specimen salmon lottery ticket' in the hope that the next tug on the fly is from a fish that will show me who's boss throughout the ensuing battle. When you hook a big fish there's an 'out of control' feeling and there's nothing you can do but take your time in the hope you'll eventually get a chance to land it. The sheer power from a heavyweight River Tay salmon that's boring down deep and cruising about slowly under its own free will is a really magical part of the sport to my mind. You can be 20 or 30 minutes into the battle with a big fish before you get a brief look at it should it surface or allows you to temporarily steer it in close to the riverbank. For me personally the initial take from a salmon induces a release of adrenalin which instantly changes your focussing ability and almost seems to slow down time until you let the take develop and set the hook properly. With a big salmon you'll receive another spike in your adrenalin levels when you eventually get a look at it which is often nowhere near the end of the fight! This is all part of the fascination of Scottish salmon fishing and it's ability to switch from a total calm admiration of Mother Nature into absolute focus and anticipation when the first tug on your fly is felt. Book a River Tay salmon fishing experience and give yourself a chance of an encounter with one of its famed heavyweights. My experience has been that there's an early run of heavyweight Spring salmon that ascend the Tay from January to March each year and traditionally June was always a big fish month on the Tay too. When the spates of Autumn arrive that encourages heavyweight Autumn salmon to move in too and it was the month of October when the British rod caught record salmon of 64 lbs was captured at Glendelvine. 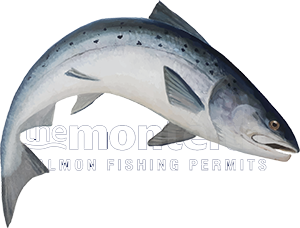 In recent days salmon up to 29 lbs have been landed but make no mistake about the fact that there will be much larger Autumn salmon than that in the Tay right now awaiting a perfectly presented lure or fly.